Tony is all about food. His ongoing food events and special projects have been featured in the press. 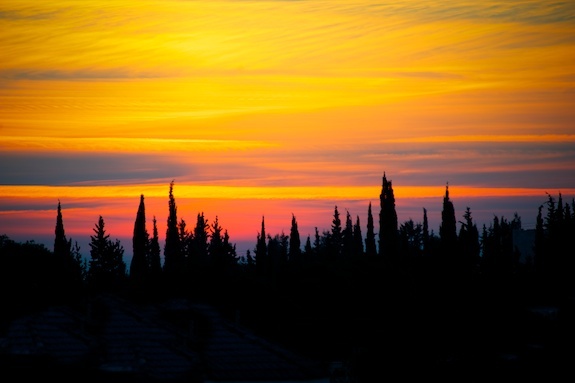 To learn more, you can view his gallery, read his blog, or simply contact him directly. You are currently browsing the archives for February, 2011. Something came up last minute and my grandmother’s sister has to travel; everything, though, should be fine. I spent the last couple of weeks looking at apartments and finally moved a few days ago. I unpacked my things, tested the washer, took a deep breath, and made soup. 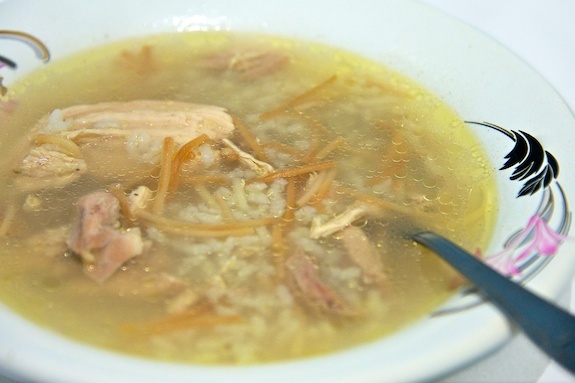 Chicken noodle and rice soup. I learned this recipe from lunch at my friend Georgette’s house. Georgette, or Juju as everyone likes to call her, is one of those people you can’t not like. Not even if you tried. She possesses that tender grandmotherly spirit that loves and cares for everyone. She can’t help it. 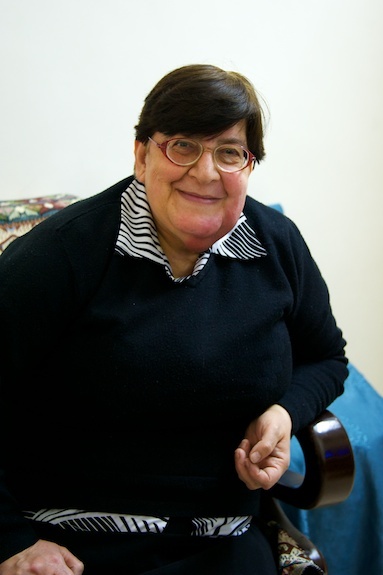 Georgette is in her sixties, is recently-widowed, and has a heart made of pure gold. Tant Juju (Aunt Juju) invited me over for lunch several times while I was looking at apartments. Aside from being an angel, she is also an incredible cook. Her style is simple and homey. She makes the kind of food that you eat with gusto, and in generous servings. Whenever I say something too polite she tells me to stop acting like a stranger; she considers me family. Tant Juju cooks out of a tiny kitchen that barely fits the two of us. While she cooks I usually stand by the doorway of her kitchen and keep her company. We chat, but mostly I observe from a distance. There are no measuring cups or spoons; no hesitation, no fuss. Her cooking reminds me of a good dance performance. Tant Juju is graceful, but assertive in the way she cooks. This is her domain. You could tell by the way she adds ingredients with confidence that she’s been doing this for a while. The day Tant Juju invited me for over for soup, I actually went out of courtesy. I had already grabbed a quick bite to eat in the street, but you can’t say ‘no’ to Tant Juju. She won’t have it. 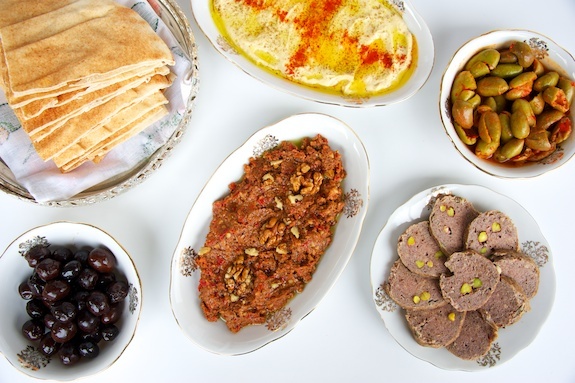 It’s part of Aleppan hospitality: eat, eat, eat, then eat some more. So I went. And I ate. And I loved. And ate some more. It was perfect. In celebration of Tant Juju’s amazingly simple and delicious soup, this was the first dish I made in my new home. Try this recipe before winter is gone. Like Tant Juju, it’s impossible not to like. 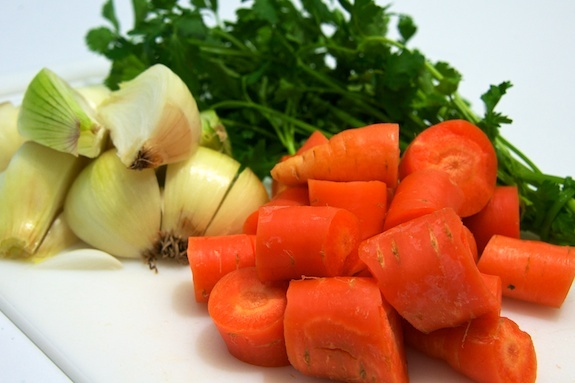 Before adding any of the vegetables, try to remove as much of the scum from the surface of the stock as possible. This way the vegetables won’t get in your way. Rinse chicken under cold water. Make sure to remove the gizzards (they are usually in a bag inside the chicken). 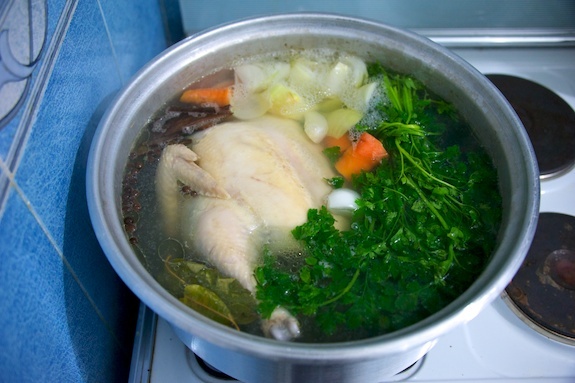 Fill a large stock pot with water and add chicken. After removing the scum, add the spices and vegetables to the stock. 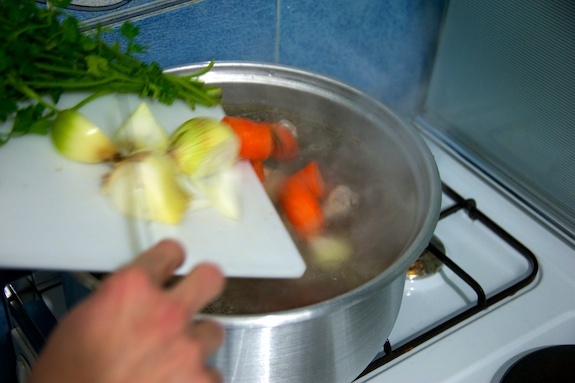 Continue cooking for another hour over low heat so that the stock barely simmers. Remove chicken from stock and allow to cool for a few minutes. 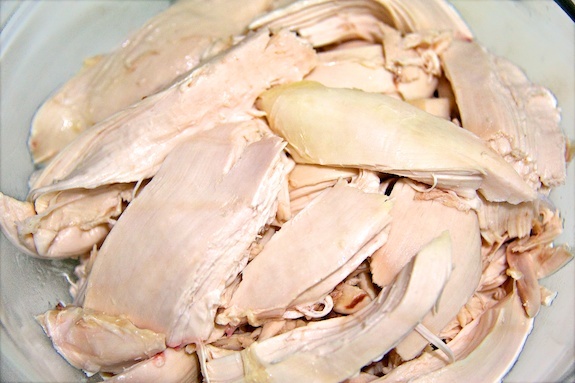 Remove the meat from the bones, shred, and refrigerate until ready to use. Return chicken bones back to stock and continue to simmer for another 2 hours. 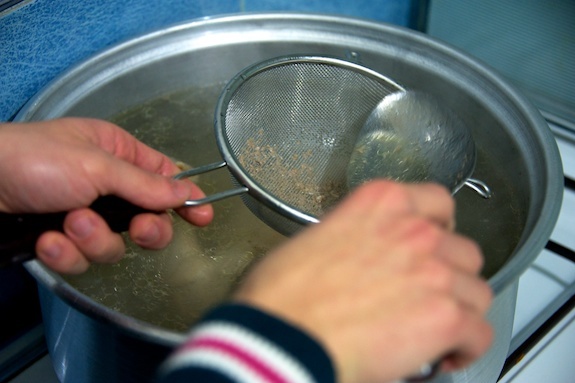 Strain stock through a fine-mesh strainer. Remove layer of fat from stock (optional). 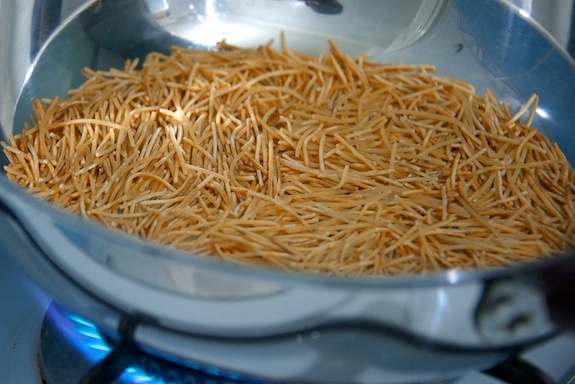 Toast noodles in a dry pan until golden brown. Bring stock to a simmer over medium heat, and add toasted noodles, rice, and chicken meat. Ready to serve once rice has completely softened. 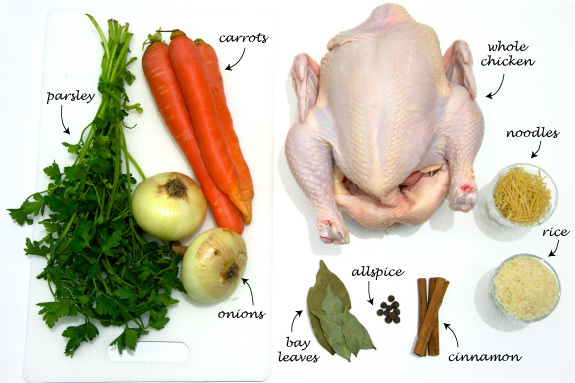 Notes: Make sure not to stir the chicken stock too much since that will produce a cloudy stock. If you’re in a rush, you don’t need to refrigerate the stock. Simply strain the stock from the bones and vegetables, and continue by adding the toasted noodles, rice, and chicken meat. I don’t know why or when it hit me, but the other day, as I was laying in bed after lunch, I realized I had been struck with a case of homesickness. My stomach was in knots and my thoughts floated home, across the Atlantic. We were told by the Fulbright committee during our pre-departure orientation that this is common; I wasn’t worried. This period of longing, however gloomy, gave me time to clear my thoughts and get other work done. I took a trip with friends to the outskirts of Aleppo and also worked on programming — behind the scenes geeky stuff that secretly makes me happy. As for my blog, I think it has also benefited from this period of thinking and rethinking. It has planted in me a new seed of enthusiasm and great ideas. I consider my blog my baby. As of today, it is 3 years and 5 months old. It may sound strange to those who don’t blog, but I feel my blog has evolved over the years and has made me grow in ways I had never anticipated. My blog opened my eyes to web design and web development; it continuously fuels my immense passion for photography. My blog connects me to wonderful people and encourages me to try new foods and food techniques. It offers me a creative space to write and express my feelings in words, pictures, and videos. And although I have on-and-off spells where I feel unmotivated to produce, this is something I’ve realized is a part of life. I have learned to grow from these bursts of inspiration and grapple with the moments when my mind wanders and my stomach is in knots. One of the things that makes food blogging so appealing, I think, is the community it is built on. When I write a blog and post it on this tiny corner of the internet, I feel I am sharing stories and experiences with friends gathered around my dining room table. It’s an amazing feeling. It is real and intimate and funny and mushy and I love it. This is a metaphor that has stuck with me from early on, and one that has kept me focused on what my blog means to me. Thank you, always, for your encouragement. 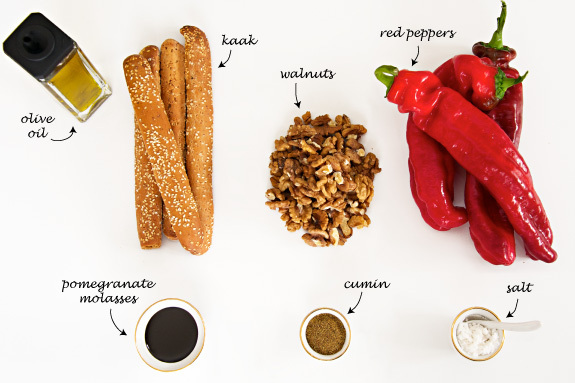 Today, in celebration of rethinking, I want to share with you a recipe that I’ve blogged about before: Muhammara, a rich and tangy Middle Eastern spread of red peppers and chopped walnuts. It’s a spread that should never be missing from your refrigerator. 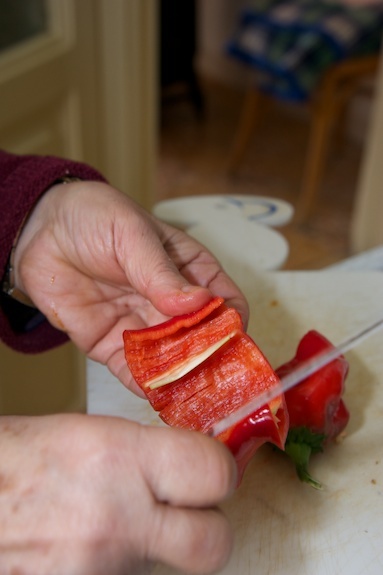 My aunt cleans red peppers and keeps them in a bag in her freezer for on-the-fly muhammara. It’s a spread that you can put together in 5 minutes and tastes better if you prepare it the day before. 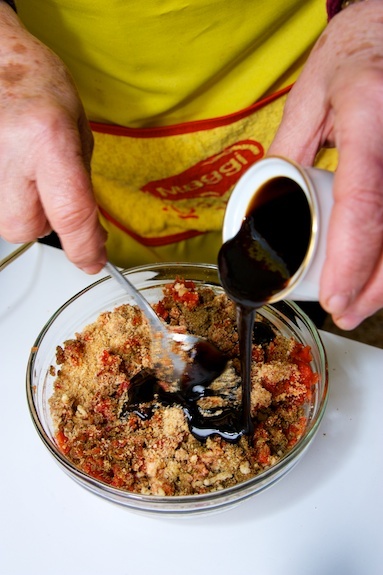 The flavors meld and food magic happens. In Aleppo muhammara is commonly served as a side platter as part of the mezze spread, but I put in on almost everything. Sandwiches being my favorite so far. Just a light smear on the bread does the trick. Try it, and let me know. 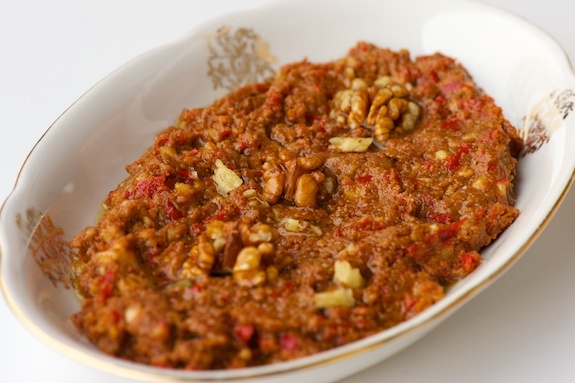 In the olden days, muhammara used to be considered a spread for royalty and the wealthy upperclass because of the ingredients required to make it. Walnuts and red peppers still aren’t cheap, but have become more accessible. Today the amount of walnuts you add to your muhammara has even become a pseudo status symbol. Since we’re friends, and I know you won’t laugh (OK, you could laugh a little bit), I’ve also dug up this old video of me making muhammara for a Food Network audition. The video was filmed and produced by my very talented friend, Marilyn Rivchin, Senior Lecturer of Filmmaking at Cornell University. I didn’t get the part, but this clip reminds me of how much I love cooking. The ingredients for this muhammara are mostly the same as the last recipe I posted, but my aunt taught me to add a dash of sugar to the spicy dip. It’s not traditional, but it works. It rounds out the spiciness of the pepper paste and balances the tang of the pomegranate molasses. I added it as an optional ingredient in the recipe. 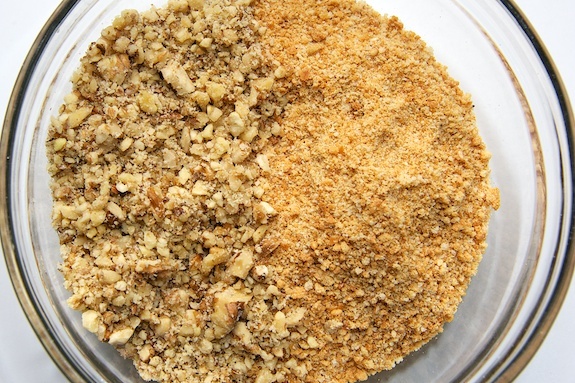 Process the kaak in a food processor until finely ground and set aside. 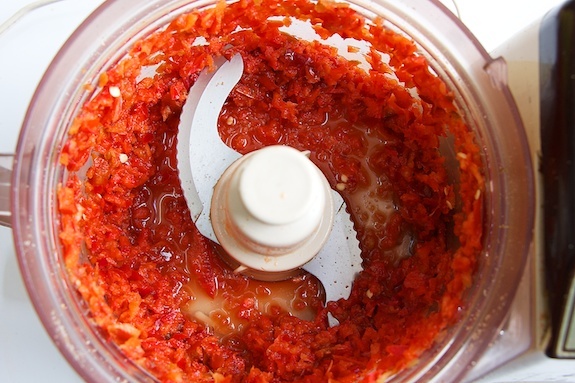 Process the red bell peppers in the food processor until finely chopped. In a large bowl, combine all the ingredients together, cover, and refrigerate until ready to serve. 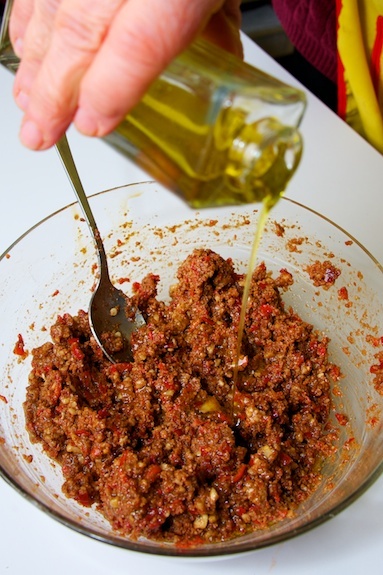 To serve, spread the muhammara into a shallow dish, drizzle with some extra virgin olive oil and garnish with toasted walnuts. Plate alongside some pita bread and enjoy! Notes: You can find kaak in most Mediterranean or Middle Eastern markets, but breadcrumbs serve as a suitable substitute. I recommend a tiny bit of red pepper paste for a kick, but feel free to adjust the quantity to your liking. In my early days of experimenting with muhammara in Aleppo, I came up with this simple snack that I now eat on a regular basis. 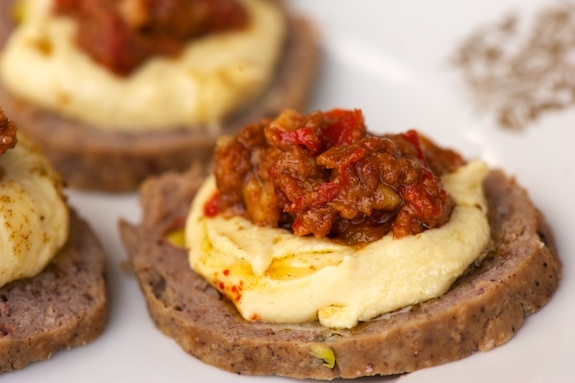 It’s simple and incredibly delicious: a slice of Aleppan Mortadella, topped with a dollop of creamy hummus, and a kiss of spicy muhammara seals the deal. Enjoy!